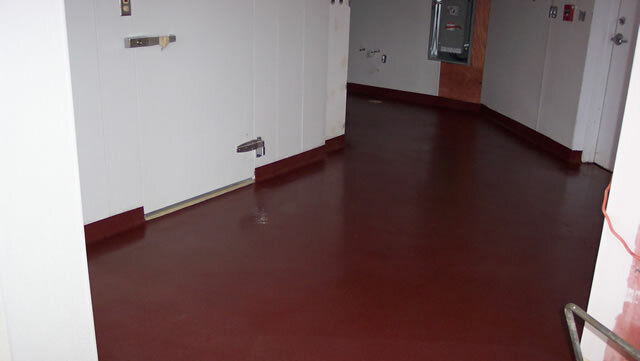 A great option for areas that require a lot of cleaning, such as commercial kitchens, bathrooms and veterinarian areas is an epoxy/quartz system with an integral cove base. 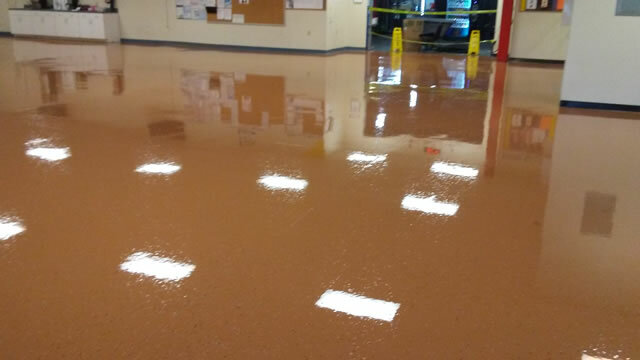 The custom blended colored quartz gives the floor an attractive look and just the right amount of slip resistance for a surface that has to stand up to a lot of abuse. 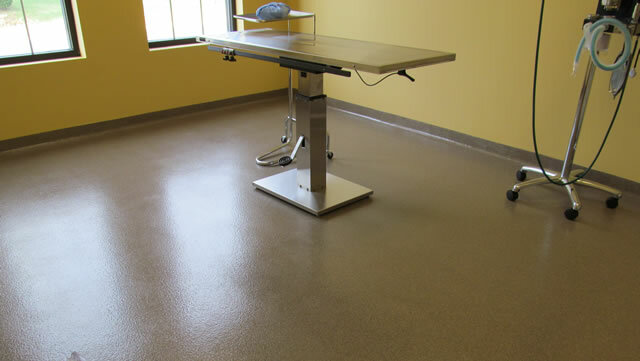 For areas that don’t require the integral cove base, an epoxy system with a full broadcast of custom blended PVA chips or colored quartz gives a durable and attractive surface. 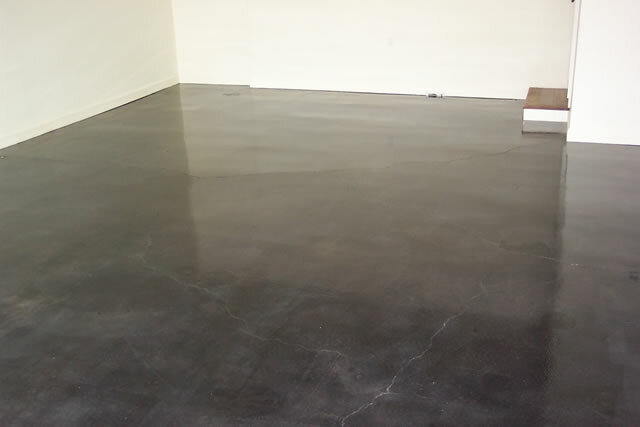 Chips come in 2 sizes and will have a little smoother surface than the quartz, but still offer good slip resistance and easy maintenance. 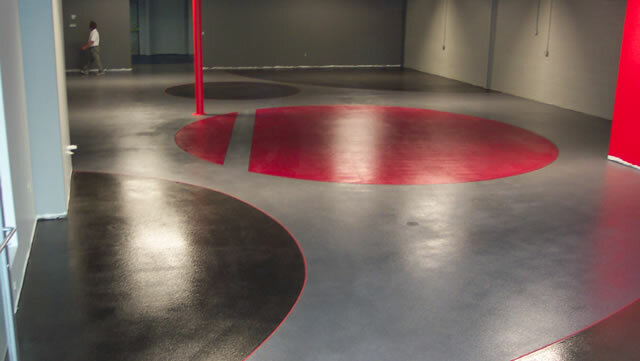 Great for garages, show rooms, lobbies and game rooms. 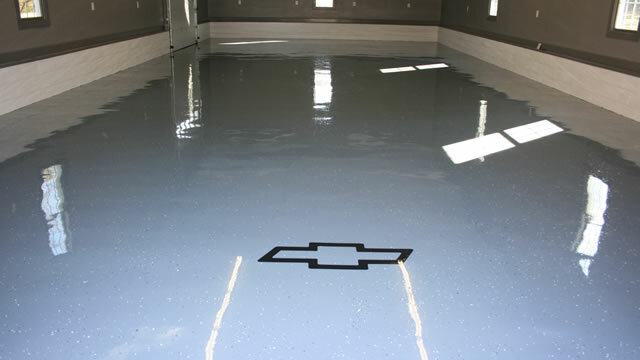 Showroom designed by Perper Design, Summerfield, NC. 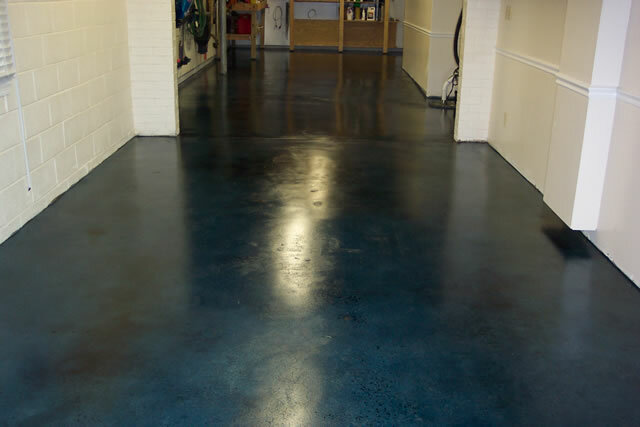 A popular choice for garages and other areas is applying a solid color epoxy, adding scattered chips and a polyurethane top coat. 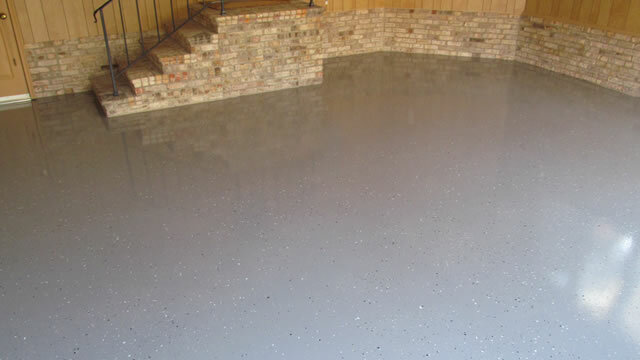 The 2 coat system is tough but economical. 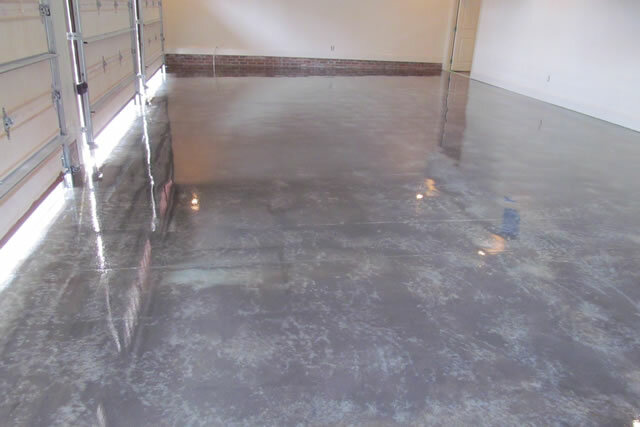 An additional coat of epoxy can be added to the system to give it a smoother, richer look. 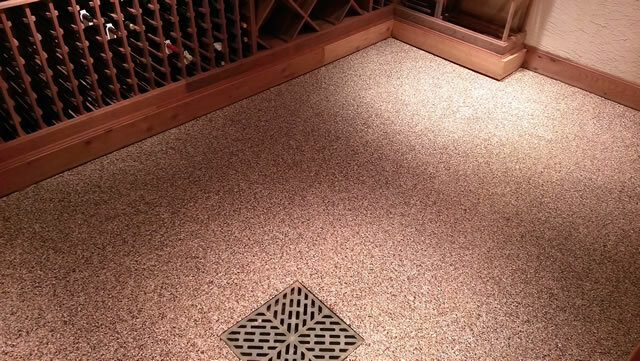 The custom blended chips help hide dirt and marks and add a decorative element. 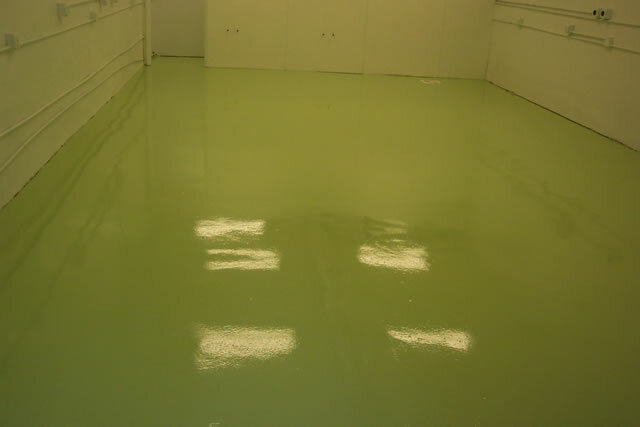 Solid color epoxies, polyurethanes and sealers offer a clean look with easy maintenance. 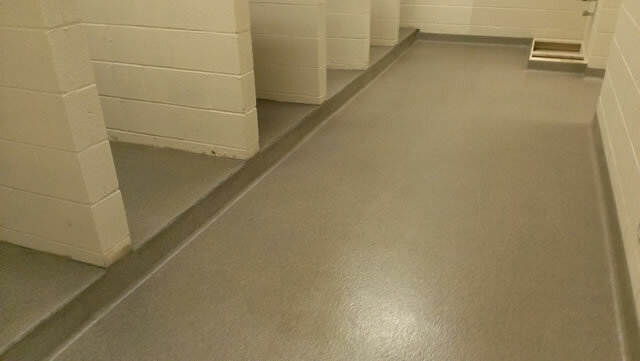 Lighter colors increase light reflectivity and brighten up spaces. 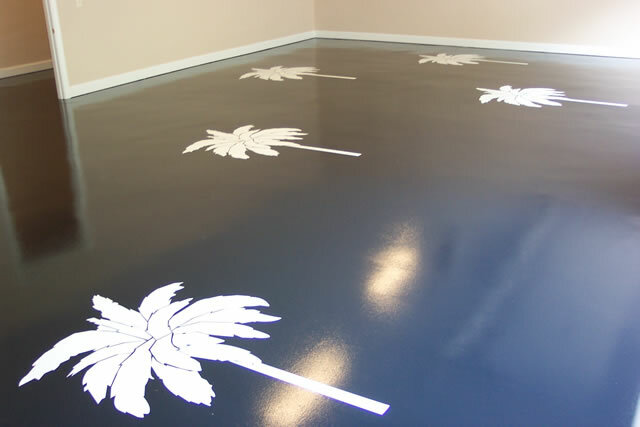 Sand and other materials may be added for slip resistance and logos, emblems and scores add a decorative element. 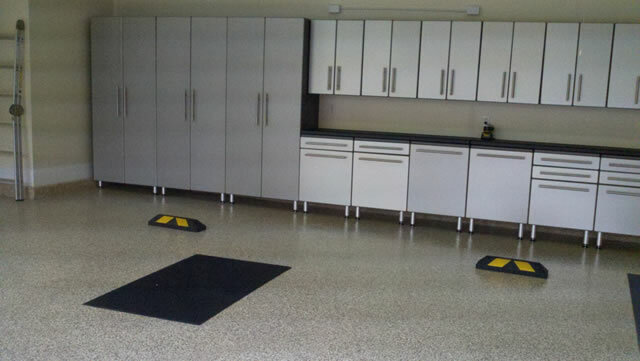 Some garages pull double duty and offer extended man cave or party spaces as well as housing cars. 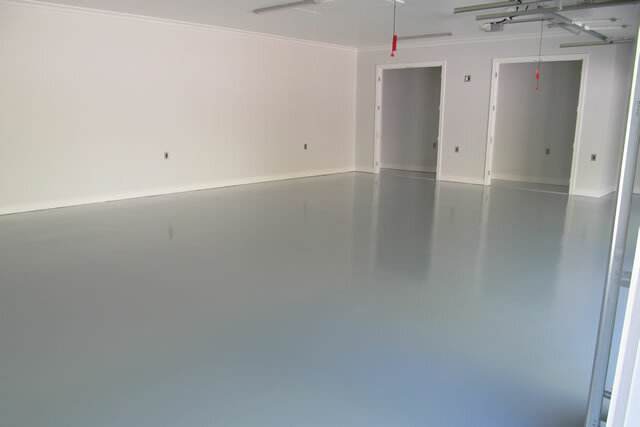 A stained floor or just clear coated floor serves this multipurpose use very well.